Thanks so very much for all your concern and well wishes for Roxy. We really appreciate all your lovely comments and emails. After a week off school she went back today and is doing well. Lost: I seem to have lost my blogging mojo after a week off. Today I have struggled with the idea of posting. I'm hoping to find it again really soon. Also my google reader is bulging at the seams with 1000+ yet to be read posts. I hate to think what the "+" refers to. 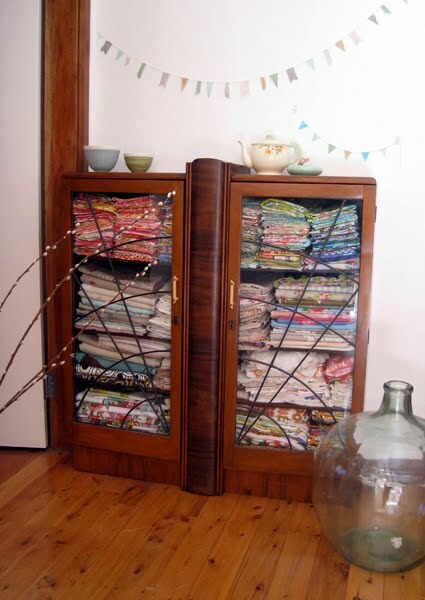 Found: A new (or possibly renewed) love of sewing. I had a lot of sewing to do in prep for Handmade last weekend (which was great) and I have lots of new and fun ideas for things I want to sew and sell. I'm hoping to get a couple off the ground in time for Finders Keepers later this month. 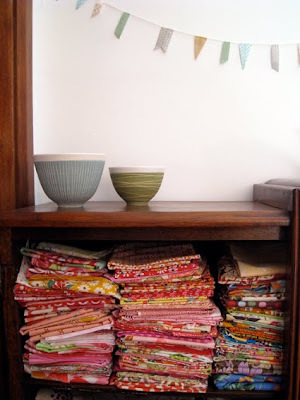 This new/renewed love may have something to do with my reorganised and very visible fabric stash. My dad restored an old art deco china cabinet for us some years ago and it was in the lounge room with my great grandmother's Shelley dinner set and other bits and pieces in it. I wasn't loving it there so I decided to move it and use it for my fabric - which was previously hidden away, in a bit of a jumble in a cupboard. I'm loving it now. What do you think? I had meticulously folded and organised all the fabrics in neat piles according to colour, but during the recent sewing frenzy things have become a bit more 'relaxed'. 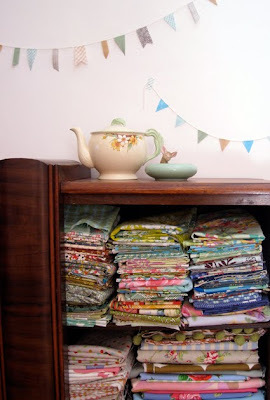 I know my fabric stash is tiny compared to some, but I'm finding it so inspirational. How do you organise your fabric, and where do you store it? Maybe you've blogged about it... post a link if you have one. I'd love to see! I hope to be back tomorrow... once I locate that damn mojo.